A long-standing issue in the field of engineering has been the representation of women. Of the students that pursue undergraduate studies, half are women. 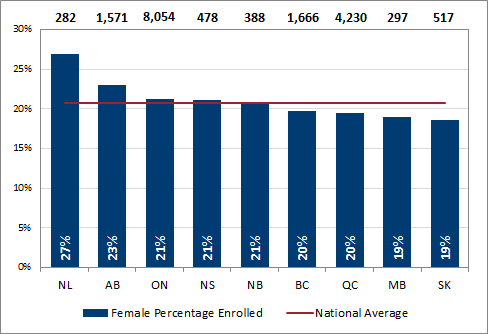 However, to this day, women make up only 21% of engineering undergraduate students in Canada. This number has not significantly changed in almost 20 years. Additionally, women make up only 17% of newly licensed engineers nationally. As we look higher and higher up the corporate ladder, fewer and fewer women are visible. Our engineering education research in this topic area began in 2016 with a short survey study presented at the Canadian Engineering Education Conference. Since then we have been interviewing and compiling badly needed data on retention aspects for women in engineering. Our initial focus was on undergraduate education (see our article and details of that study here), but we have since expanded into studying practice and academia. If you are interested in collaborating with us please contact our group.